College of Business Dean Scott Johnson speaks to the Chicago M.B.A. students on Orientation Day. 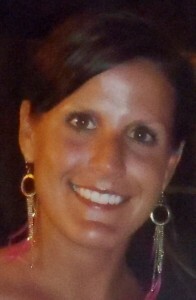 Chicago M.B.A. student and Illinois State alumna Lisa Stahl. Lisa Stahl ’05 has thought about getting her M.B.A. for years. She was kicking around the idea in 2009, but the thought of taking the Graduate Management Admission Test, or GMAT, was overwhelming—especially since she’d been out of school four years. But with her employer paying for her GMAT prep course last summer, she worked up the courage and decided to take the test. Then, just a few weeks before test day last year, she got a postcard from Illinois State University announcing the College of Business’ new M.B.A. program in Chicago. The downtown classes were perfect—she’d just moved to the city—and the shorter, 19-month program duration was a bonus. “I’m so lucky it came when it did,” said Stahl. Now, Stahl is one of 15 students—10 of them Illinois State alums—in the inaugural Chicago M.B.A. class, which started in February. Aiming to deliver the same top-tier experience as the on-campus and Corporate weekend M.B.A. programs in Normal, the Chicago M.B.A. is a cohort-based program targeted toward full-time business professionals with significant work experience. College of Business faculty member Rick Ringer leads a discussion with the inaugural Chicago M.B.A. students. Students in the inaugural class, like Stahl, share a desire to break through to that next stage in their careers, while relishing the chance to interact with a small, diverse group of like-minded peers. “I liked that it was new. That made it more exciting,” said Connie Lee, another Chicago M.B.A. student. The program was a key factor in Lee’s decision to move to Chicago from California, where she got her undergraduate degree and then worked for five years in accounting. Lee had her eyes set on reaching a higher, management-level point in her career, so she began considering an M.B.A.
She loved visiting Chicago, and the Friday-Saturday schedule for Illinois State’s M.B.A. program was a major selling point, as was the University’s reputation and its affordability compared to similar Chicago programs. Lee now works in the Loop during the week and takes public transit to her M.B.A. classes every other weekend in the Crain Communications Building on Michigan Avenue. Lee loves the smaller class size and the discussions that can spawn. “I feel like everyone’s on the same page,” Lee said. The Chicago M.B.A. program is based on Illinois State’s accelerated, weekend Corporate MBA that has been offered in Central Illinois since 1994. Graduates of that program say its cohort-style design leads to greater student-to-student interaction and learning, said MBA Program Associate Director B.J. Newmister. The 15 students will finish up the first of 12 courses (Business Perspectives and Leadership Skills) this coming weekend, and then start the second course April 12. That pace means they’ll finish the program entirely in September 2014 and be eligible to walk in Commencement in December 2014. They’re all working full-time jobs, Stahl says, but the weekend schedule is not overwhelming. In fact, she says it’s clear everyone in the program looks forward to class—instead of dreading it. “If it was easy, everyone would do it,” said Stahl, who works at Metlife and lives in the West Lakeview neighborhood of Chicago. Chicago M.B.A. student Paul Bosler. The rigidity of the course schedule (Friday night and all day Saturday, every other weekend) attracted Paul Bosler to the Chicago M.B.A. program. That allows him to schedule his business and personal life accordingly. “You know when you start, you know when you end,” said Bosler, a father of two. 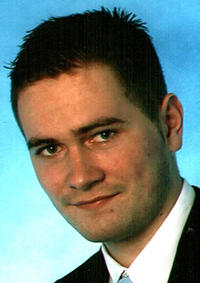 Bosler, who grew up in Germany and got his undergraduate degree in international business and finance in Frankfurt, was sent by his company, Bosch, for a three-year assignment in the U.S. Bosler, who works in international trade, is already part of a Bosch program for employees with potential for management positions, so he felt an M.B.A. would advance his long-term career goals. “It’s a great name. It’s Illinois State, so no matter where I go with it (his M.B.A.), Illinois State University is known,” Bosler told STATEside. Bosler, Stahl, and Lee say their first professor, Rick Ringer, has done a great job sparking dialogue in their Business Perspectives and Leadership Skills class. “It’s more like a conversation than a class,” Bosler said. 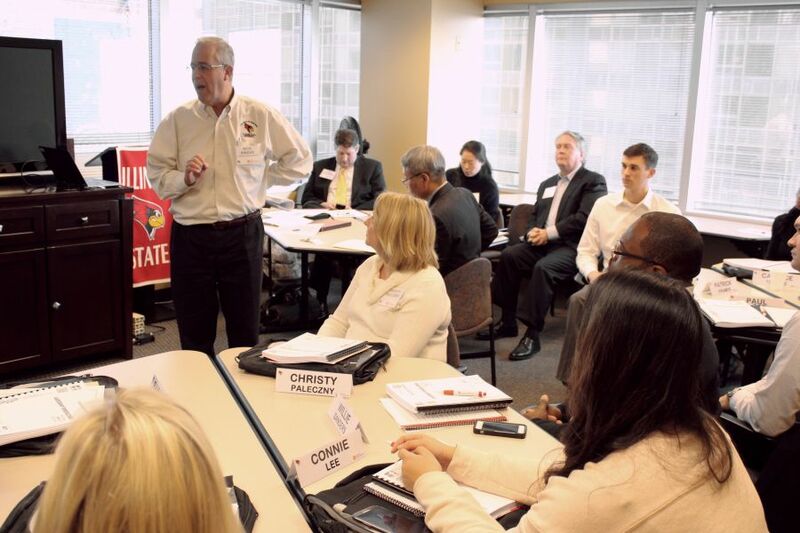 Those full-time faculty members from the College of Business give Illinois State’s M.B.A. program an edge on other weekend programs in the Chicago area, where almost 60,000 ISU alums reside. “We’re not watering down this experience,” Newmister said. If all goes as planned, the second crop of Chicago M.B.A. students could start in late 2014 or early 2015. I would like more information regarding the week end MBA program.